Psalm 55:22 - Cast your cares on the Lord and He will sustain you; The Lord will never allow the righteous to be shaken. The grief of losing a family member. The plans you’re making for the weekend. The heartbreak of a breakup. Struggling to stay on a budget so you can get out of debt. The sting of a betrayal. The shame of that mistake you made years ago that you can’t seem to let go of. The doubts you have about your faith. Whether it’s a huge crisis or a small dilemma, it all matters. Sometimes we wonder if God really does care about whatever that “it” might be in our lives when there are so many things happening everywhere else. Sometimes our problems might seem small when we place them next to the problems facing people around us. And they might be small. But small still matters. Sometimes it’s the little things that expose big issues in us that God wants to deal with. It’s the little things that stay with us, make us worry and cast shadows in our lives longer than the Empire State Building. The only way to fight worry is to bring God in on everything that’s going in our hearts, in our minds and in our souls. God wants us to be warriors, not worriers! Don’t act like “it” doesn’t matter when it does to you. It matters to you for a reason, and you have to work it out with God in order to figure out why. Don’t minimize your pain, your hurt, your cares. Don’t shrug “it” off and say it’s no big deal. Bring God into your situation. Whatever “it” is in your life, it matters. It matters to God. He doesn’t have us on some priority list, asking us to wait for Him to solve all the other problems in the world before He listens to ours. He hears your cry for help right where you are because He wants to restore you, sustain you and strengthen you. 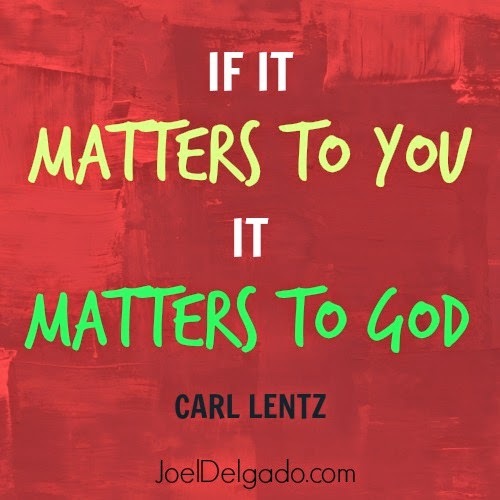 Yes, it matters to God because it matters to you and because you matter to Him.